We thought it was about time that we celebrated all the lovely things that we had in our February Troublemakers box. The featured book was All About Mia by Lisa Williamson. This book truly stunned us. The main character, Mia, feels so familiar to me; as I turned the pages I felt like I knew her inside out and I found myself wincing at her every mistake and teary-eyed at her failures. I was sad to say goodbye to Mia after I had finished the book and I instantly knew that we had to share her with all of you. Thank you so much to Lisa Williamson for writing such a funny, gut-wrenching, uplifting book, we can’t wait to chat about it in our Clubhouse meeting. We have received so much love from all of our lovely subscribers about our Troublemakers box and we’d like to say thank you once again. All of the posts you tag us in, your messages and photos really mean the world to us. We screenshot each one and send it to each other and we feel so lucky that our phone galleries are full of kind people saying encouraging things! We had the chance to work with some amazing craftspeople in February too, so thank you to all of these talented people for going out of their way to make our Troublemakers box so fantastic. It’s All About Me personalised badge by Book Box Club: For us, it’s really all about our subscribers so we made personalised badges for all of our February members. 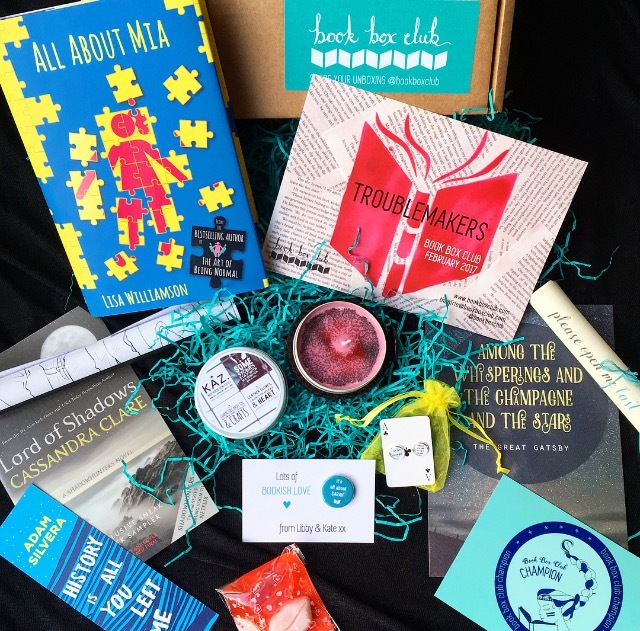 Bookish goodies: Special extras from our friends at Simon & Schuster. So there we have it. We really enjoyed putting this box together and we hope that you had fun unboxing yours. Keep tagging us in your photos because we love seeing our box items in use and we know our box suppliers do too. Happy reading and happy weekend to you all!